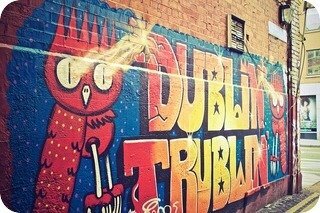 So many iconic images of Dublin to choose, but the first law of web site maintenance is that when the owls with laser eyes want something, you don’t argue with them. The Escape chain is the first to get to four different locations covered by this site, though may not (or may yet!) be the first to get to four different locations within the UK, for this is their first site in the Republic of Ireland. Specifically, their new opening is in Dublin. For completeness: Escape also have two copies of their da Vinci room and one of their Contagion room installed at Escape Yourself in Tours, in France, and their Escape Game Design spin-off may well be involved with other locations around the world. It may be the case that the process of getting this Dublin location has proved more difficult than any of the three before it, but that’s part of the additional difficulty of becoming a multinational corporation! The location is opening with a brand new game: Espionage, with an unusual story. “Our first game in Dublin is called Espionage. It is set in an everyday apartment. However as you may expect there is a twist. Your team have been challenged with retrieving data that has been obtained by the journalist residing there. The apartment consists of clean lines and minimalistic design to hide a variety of complexities. In rooms containing hidden drawers, locked boxes and other more obscure items you need to try and find where to begin. That could be the biggest puzzle of them all.” There may well be another twist in the tale as well! This brand new game is set to be accompanied by a da Vinci room very soon. Dublin is becoming better and better served for exit games, with the native Irish XIT and a local representative of the international hit franchise Adventure Rooms. (Sadly the local branch of fellow multinational ESCAP3D is temporarily closed; we hope the return comes swiftly.) Considering the mix of originality and the experience of the game designers, it would be a great trip to try to hit them all at once!